“Dispensations of Mercy come when we are without recourse. We have perhaps lost our way, become unable to find our way through or have caused some great effect, for better or worse, that we did not intend. It might even be through our own hand that we have caused such a situation, without intention or malice, we just proceeded in a certain way because we had not yet learned the wisdom needed to avoid it. Or perhaps our own guidance led us into darkness consciously so that we could learn something valuable and we are a bit stuck! We may have perhaps been causing harm to others through our own unconsciousness. We could be suffering from a heavy karmic lesson from this or another lifetime and our Soul may be struggling to really integrate the lesson and feel free to rise up and move on. Perhaps we are in a situation with another where we hold great power. It might be as a parent, a teacher, a healer or a boss. It might even be in a less obvious position of power where we could take advantage of another’s care for us to secure what we want. These situations call for the quality of divine mercy. Healing With The Mother Of Mercy: “Lay comfortably with your eyes lightly closed and be aware of your heart. Imagine a soft ivory light glowing in your heart. This is the Vase of Kuan Yin containing Nectar of Mercy. Imagine you can follow the breath and perceive within the vase. Inside there is the most beautiful liquid light. You become aware of a soft pale hand holding the vase lightly and this is the hand of Kuan Yin. She gently tips a few drops of this precious Nectar into your heart now, chanting delicately, “Om Mani Padme Hum.” Allow for the healing of Mercy to flow into your heart, cleansing it and allowing it to open like a lotus blossom. When you are ready, become aware of your feet, imagine yourself standing firmly on the ground or take the time to actually do so. Imagine the Nectar of Mercy flowing out of your hands and feet, into your life. When you are ready, bounce gently on your feet until you feel ready to open your eyes. The Nectar Of Mercy brings peace and bliss untold. which the grace of Kuan Yin helps me reach. The magical elixir of the Divine Nectar of Mercy is a sacred combination of Love, Light, Forgiveness, Compassion, Gratitude and Wisdom. Will you accept it now? Whatever is going on in your life now can be healed and resolved. It may not be in the way that we think it should happen, and it may require us to be humble; to completely surrender and to accept what is on offer to us. Can you find a way to have this kind of faith? Can you trust in the Divine Mother to guide and protect you; show you the way? There is so much love for you in the arms of Our Divine Mother. There is mercy here, not judgement or condemnation. We are so hard on ourselves, we decide what we are worthy of and we are so blind to the truth of who we really are. We hide behind the masks of our personality, our experience, our beliefs and our limitations. Yet we are all powerful, magical and Divine. 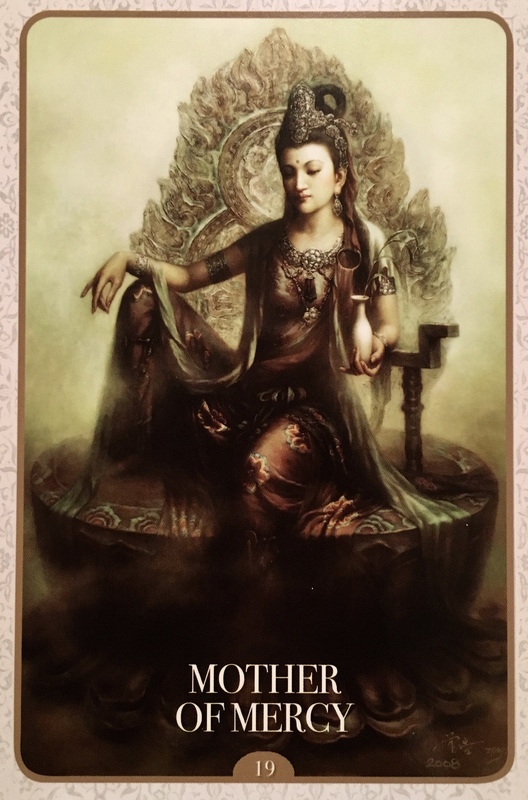 Offer yourself, heart and Soul to Kuan Yin for transformation and healing. Trust her with your very existence, your core essence. Know that things are changing, and that you need her assistance to get to where you need to be. Trust, Dear One, the Divine Mother is by your side.